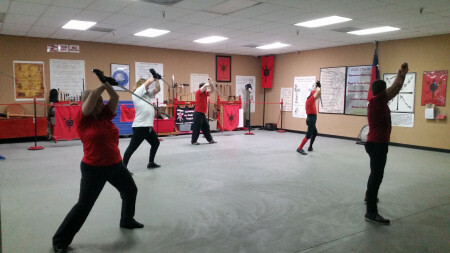 Instruction in the use of the longsword exposes the new historical fencer to the fundamentals of combat with all Renaissance close-combat weapons. For this reason, all new members (called “White Shirts”) first study to develop core skills in basic and intermediate longsword techniques. Upon the successful completion of three month-long courses and demonstration of proficiency, the member will be allowed to test for his Scholar (“Red Shirt”) Ranking. Give the names & publication dates of at least three of the Fechtmeisters. Must have submitted application for ARMA Membership. 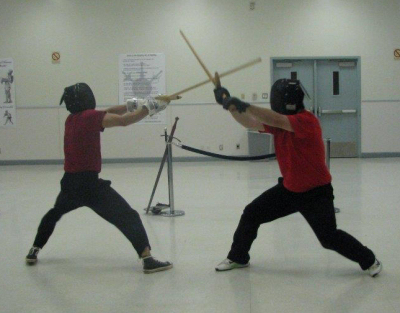 Training of basic cuts, stances, and other historical fencing techniques is performed with a waster (wooden sword). Students will begin sparring using wooden weapons, and as they become more proficient with control of the weapon, they will be allowed to progress to sparring with blunted steel (See “A Few Words Regarding Sparring” below). Our usual sessions are held on Wednesday nights from 7:00 – 10:00pm, although it is recommended that the scholar arrive 15-30 minutes early to stretch and begin warming up. 7:00 pm – Training Begins (All Students) – The entire group begins basic warmup exercises for 20-30 minutes. 7:30 pm to 9:00 pm – Course Study – Official course study begins. Beginning and advanced students (“Whiteshirts” and “Redshirts”) will work together on techniques and concepts for the given weapon to be studied that month (see schedule). Students will be expected to acquire appropriate equipment prior to starting a new weapon; new students may be loaned equipment on a short term basis only. See Classwork & Worksheets for study materials. 9:00 pm to 10:00 pm – Free Study/Free-Play – For the last hour of training, students may choose to continue working on the Course Study material for the evening, practice independently, or engage in free-play (sparring). We recommend free-play at least every other week, if not every week. Note: The last session of each month is Sparring Night. On those nights we skip the usual warmup and engage in free-play for the entire evening. The idea behind our study is to learn and master an ancient art of combat. The old German masters had the philosophy, “Was Sehrt, Das Lehrt” (What Hurts, Teaches). Lack of pain when being hit will destroy the individual’s respect for his opponent’s weapon, turning a “lethal” duel into a pillow fight. A fighter develops parrying and voiding reflexes because getting hit doesn’t feel good.